The world’s largest Muslim organization, with over 50 million members, the Nahdlatul Ulama (NU) is working closely with LibForAll Foundation to “restore honor and respect to Islam, which the extremists have desecrated,” and to “restore the majesty of Islamic teachings as rahmatan lil ‘alamin—a blessing for all creation—[which] represents a vital key to building a peaceful world” (LibForAll co-founder and former NU chairman Kyai Haji Abdurrahman Wahid, writing in The Illusion of an Islamic State). Co-sponsored by H.E. 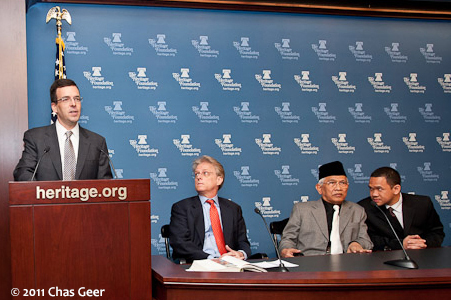 Arif Havas Oegroseno, Indonesia’s ambassador to the European Union; the Honorable Dr. Werner Langen, Chairman of the German CDU/CSU group of the European Parliament; and by the Heritage Foundation in Washington, DC, the book and its well-publicized launch at the political heart of Europe and the U.S. were intended to help transcend the increasingly polarized and strident debate on Islam that has paralyzed most Western societies. The resulting institutional deadlock—in the face of the profound threat posed by Islamist ideology, terrorism and a rising tide of Islamophobia in the West—jeopardizes the prospects of a peaceful and harmonious future for Muslims and non-Muslims alike. An immediate publishing phenomenon upon its hard launch in May of 2009 in Indonesia—the country with the world’s largest Muslim population and democracy—The Illusion of an Islamic State exposed extremist ideology to public ridicule and rejection, and decisively influenced the outcome of Indonesia’s national elections that year. As such, the book is “hugely relevant to the worldwide debate on the merits of a religious versus a secular state—especially in light of the current revolutions in the Arab world” (India Currents). Like the original Indonesian edition, which “thr[ew] a gauntlet down at the feet of radical Islam” (Jakarta Globe), the English version was co-published by The Wahid Institute, the Maarif Institute and LibForAll Foundation. “OPINION | 08 May 2011 They call him Gus Mus. One thing’s for sure: although he’s currently in Brussels and Washington, DC, it’s not on the pretext of engaging in “comparative study” abroad, like so many members of Indonesia’s [corrupt] legislature. He is a profound and mature intellectual. And though he has lots of time, it’s never enough, because he’s constantly immersed in thought and action. “Because of his broad and open heart, he’s willing to completely trust the good intentions of others. He keeps suspicion at a distance, knowing that it will only devour his energy. He lives simply in his native village in Rembang [Central Java], and has never been tempted—like so many others—by the bright lights and lures of Jakarta. “He is not a blasphemer. For he maintains perfect control of himself, never giving vent to anger or cursing others. He carefully and wisely considers every step he takes. And though he now finds himself amid the upheaval of politics [because of his responsibilities as Deputy Chairman and day-to-day head of the Nahdlatul Ulama Supreme Council], he continues to guard his thoughts and behavior. He does not remain aloof from our nation’s chaos, but reflects carefully upon the steps needed to address our many problems. “And, he is taking concrete steps to do so. He shares his profound reflections with others, through his writings. He has collected and offered many brilliant ideas to foster peace and progress in our island nation. Then, [two years ago,] he carefully arranged and presented these thoughts in the form of a book, Ilusi Negara Islam. Through this book, he cast his thoughts far and wide, and inspired millions of Indonesians to refrain from inciting hatred, inflaming others’ emotions, or encouraging their fellow [Muslims] to point swords at others. 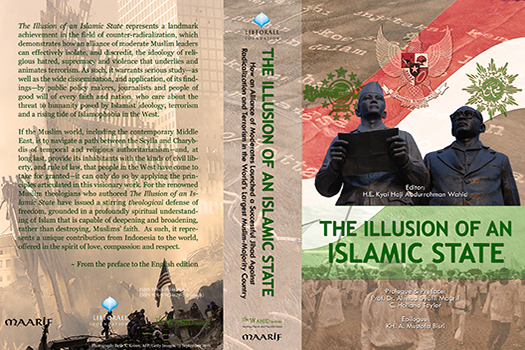 “Now he has translated this distinguished book into English, with the title, The Illusion of an Islamic State. His noble objective is to inspire not only Indonesians, but people throughout the world. In this way he is giving of himself, and sincerely inviting the ‘citizens of this earth’ to know and understand each another. To recognize that all human beings are truly our brothers and sisters, in spirit. And to realize that although there will always be conflict, this very fact obliges us to invite one another to find solutions together, cooperating in a spirit of brotherhood. 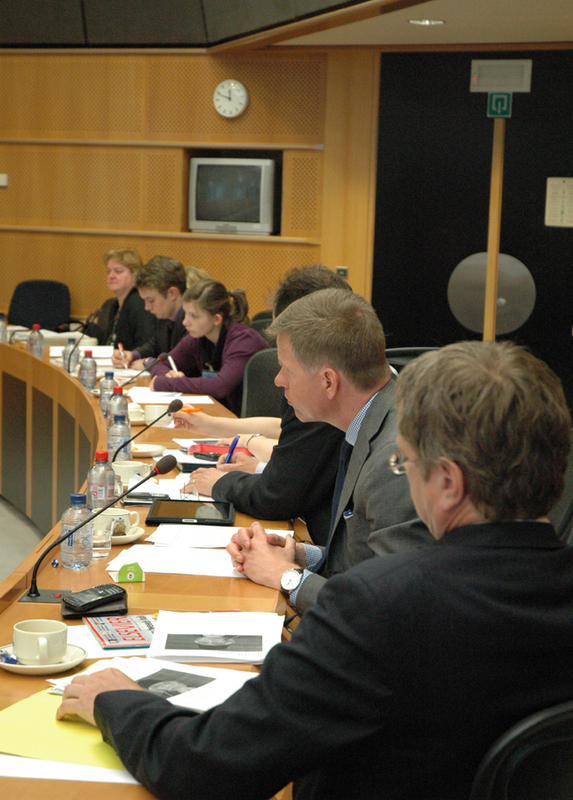 “‘Kyai Haji Achmad Mustofa Bisri, widely known as Gus Mus, a leading Indonesian religious figure, launched the English version of the book The Illusion of an Islamic State in the European Parliament in Brussels, an event that was attended by a number of European Union politicians. 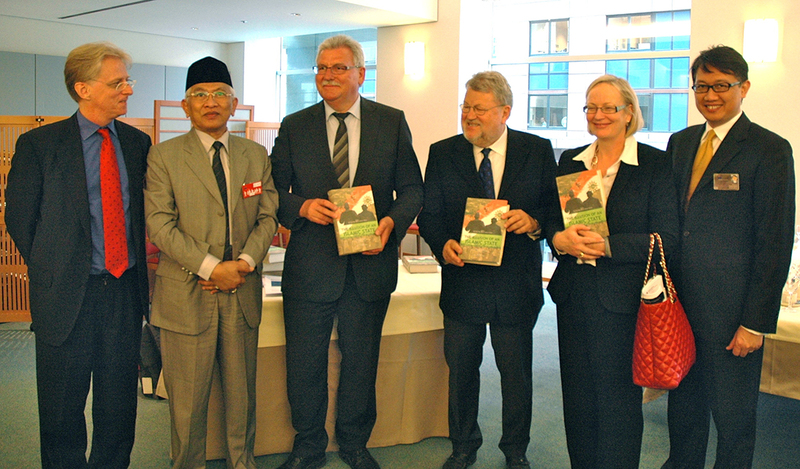 The Indonesian Ambassador in Brussels, Arif Havas Oegroseno, and Dr. Werner Langen, a German member of the European Parliament who serves as head of the Parliament’s Commission for Southeast Asia and ASEAN, served as joint hosts in launching the book, which was previously launched in Indonesia and received widespread acclaim from the [Indonesian] public. “‘Dr. 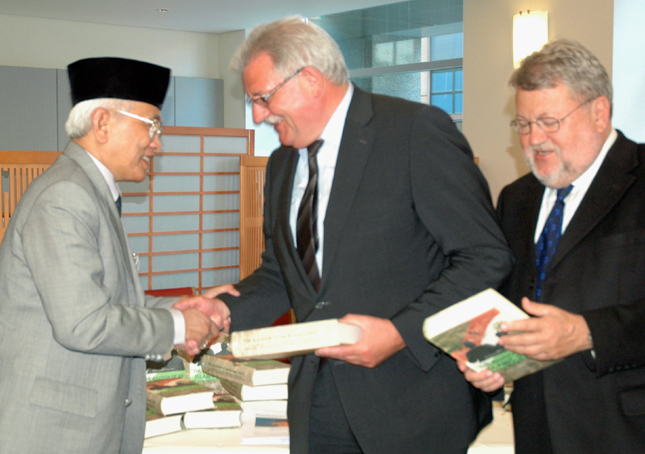 Langen (shaking hands, above), who visited Indonesia this past February, expressed his great pride at being able to sponsor the launch of this vital book, in order to expand Europeans’ horizon of understanding about Islam. 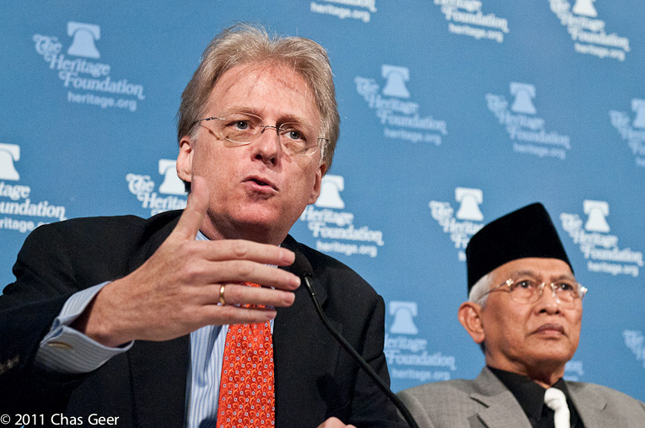 According to Dr. Langen, this effort to explain the tolerant nature of Indonesian Islam is consistent with one of the fundamental principles of the European Union, namely, to support and develop interfaith and intercultural dialogue within the bounds of Europe itself.’” Read the full article (PDF). “AS the world focuses on the death and ideology of Osama Bin Laden and the Al Qaeda terrorist network, it is worth remembering a time when Islam—especially in Pakistan—did not mean intolerance, extremism and violence… Pakistan’s descent into darkness has been chronicled by those much better placed to comment on just why things have gone so wrong. But my memories of Pakistan were recently stirred by Ahmed Mustofa Bisri, a leading Indonesian Islamic scholar, whose message of moderate Islam holds strong echoes of the religion I grew up with as a child in Pakistan…. “As head of the Nahdlatul Ulama, a leading Indonesian Islamic organisation, Mr Bisri argues that Wahabism, exported and spread by oil-rich Middle Eastern countries, must be countered by those who oppose hatred and violence…. “Listening to Mr Bisri and reading some chapters of the book [The Illusion of an Islamic State], I was convinced… that Indonesia’s Muslim scholars have the courage and determination not only to denounce such violence but also to counter it with religious arguments…. Indonesian scholars deserve credit and support and more publicity for embarking on the difficult task. Perhaps one day, Pakistan’s religious scholars will also work as fervently to reclaim Islam from those peddling a distorted version of religion.” Read the full article (PDF). 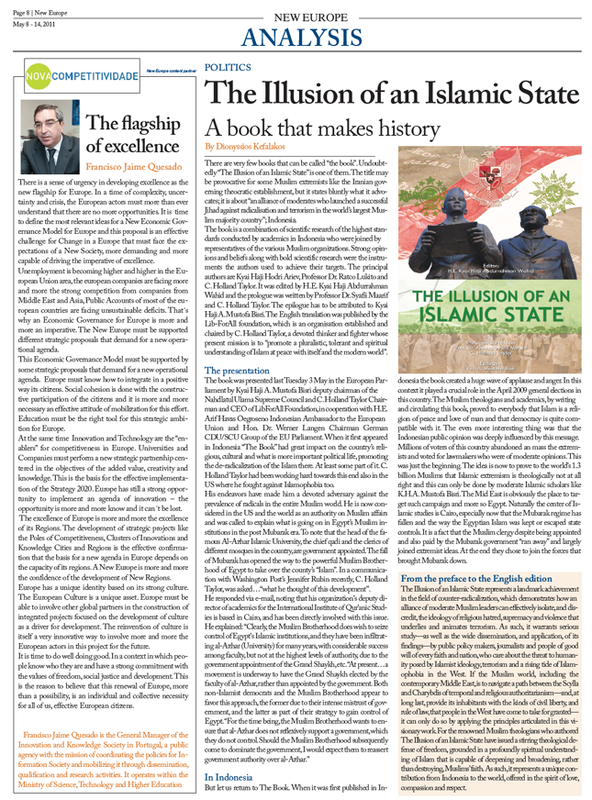 “There are very few books that can be called ‘the book.’ Undoubtedly, The Illusion of an Islamic State is one of them.” ~ Dionyssios Kefalakos, “The Illusion of an Islamic State: A book that makes history,” in New Europe. 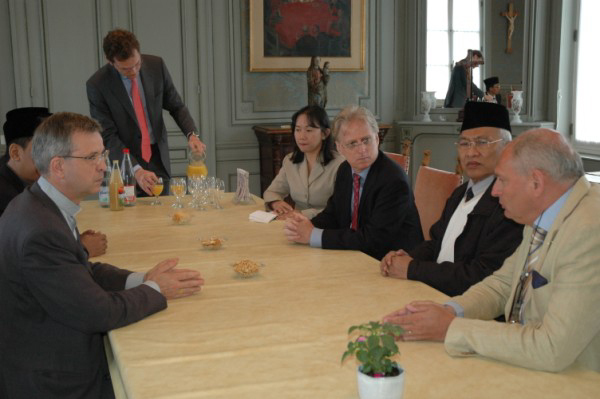 Indonesia’s Honorary Consul General, Mr. Kris Bossaerts (seated to Mustofa Bisri’s left), introduced members of the NU/LibForAll delegation to Antwerp’s Catholic bishop, Monsignor Johan Bonny (opposite), who served for many years with the Pontifical Council for Christian Unity and the Pontifical Council for Interreligious Dialogue at the Vatican, assisting Pope John Paul II with Muslim outreach. 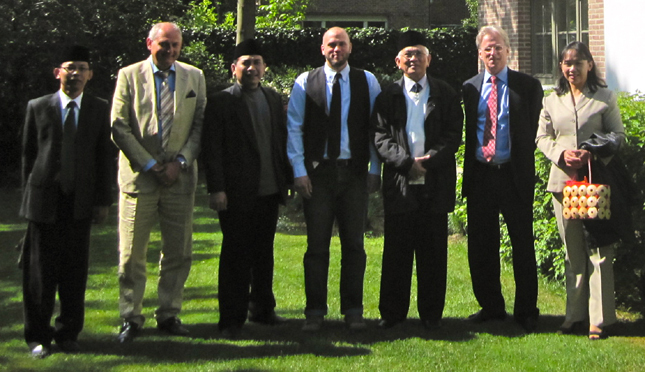 The delegation also met with a Flemish convert to Islam named Wim van Ael (center, wearing vest), who serves as Imam of a dynamic Muslim community in Antwerp, and shares the pluralistic, tolerant and spiritual ahlus sunnah wal-jama‘ah (Sunni Muslim) understanding of Islam held by the NU, which he learned studying Islam for many years in Jordan and Sudan. “Under Suharto, Muslim radicals were virtually invisible in Indonesia. The dictatorial president kept them well under control, with the aid of his military. Radicalism existed only underground, in secret, and played no significant role in society at large. It was only when Suharto fell, and Indonesia became a democracy, that radicals crawled out of their hiding places. ‘It’s ironic, that radicalism can only flourish in a democracy,’ the kyai (teacher) bursts out laughing. “The Muslim scholar clearly has a sense of humor similar to that of his illustrious friend and predecessor, former Indonesian president Abdurrahman ‘Gus Dur’ Wahid. He, too, could laugh at anything. Which does not mean that Mustofa Bisri fails to take important issues seriously. On the contrary. Especially when it comes to religious faith, and in particular, radical Muslims’ goal of establishing an Islamic state in Indonesia: on that topic the humor ends, and our interview becomes deadly earnest…. This is significant and noteworthy, because the book is directed against precisely these radicals, and against the irredeemable version of Islam they wish to impose on others. The book’s title is derived from Abdurrahman ‘Gus Dur’ Wahid’s introductory text: ‘Their dream of an Islamic state is merely an illusion, for the true islamic state is not to be found in the structure of any government, but rather, in hearts which are open to God and all his creatures.’ In other words: God and politics have nothing to do with each other. “All of the book’s authors—including, first and foremost, Gus Dur and Gus Mus—are recognized as preeminent and authoritative spiritual leaders, who represent the vast, silent majority of Muslims. “’We are the majority,’ says Gus Mus. ‘Our numbers are so much greater than theirs (the radicals). We are the majority, and should not allow such a small group to decide the future of our country.’ The smile has just vanished from his face, because there is not much to laugh about here. This is the frustrating reality of Indonesia. “The Illusion of an Islamic State has accomplished a great deal, but not (yet) solved the problem. On the contrary. It seems that Indonesian radicals have become even more brutal. Muslim thugs are attacking religious minorities, and burning churches and mosques, while the police just watch and the government does nothing to halt such behavior. The most notorious gang, the Front for the Defense of Islam (FPI), overtly threatened to overthrow the president, if he has the guts to ban their organization. And the president, indeed, has done nothing. “No answer has been forthcoming to this question, much to the frustration of moderate Muslims. Even Gus Mus’s patience is coming to an end: ‘The government should act decisively, but it doesn’t, and this only encourages the radicals. Should we [the Nahdlatul Ulama] be the ones to act? That [violence] is not our domain. But there comes a time when we must set ourselves in motion. Soon the NU will make itself heard… We have our Banser (a militia with hundreds of thousands of members). When the times are tranquil and our nation secure, Banser sleeps. But if the radicals threaten to destroy us, and force us into a corner… there will be chaos in the land.’ Read the full article (PDF). KH. Mustofa Bisri, presenting a copy of The Illusion of an Islamic State and LibForAll’s film, State and Religion, to President Obama’s Special Envoy to the Organization of the Islamic Conference (OIC), Rashad Hussain. 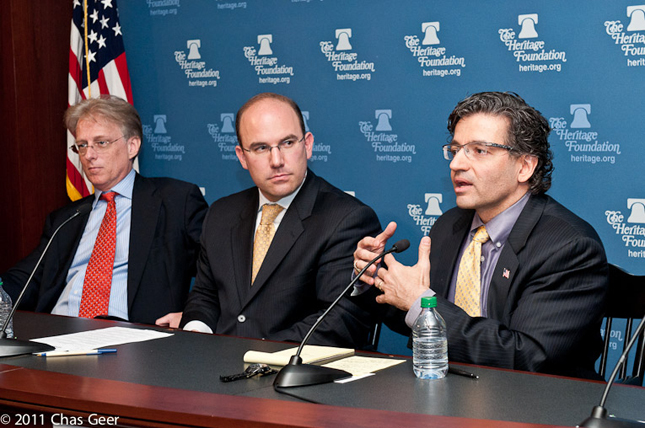 Mr. Hussain, Quintan Wiktorowicz (the National Security Council’s “Senior Director for Global Engagement” with Islam; blue shirt, center) and other Obama advisors met with the NU/LibForAll delegation for nearly two hours in the White House complex, “with plans for further discussion” (Washington Post). 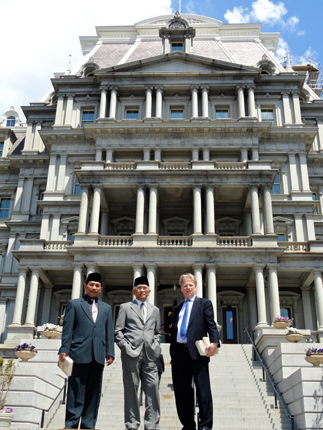 Kyai Haji Mustofa Bisri outside the Eisenhower Executive Office Building—which houses National Security Council and other White House staff—accompanied by KH. Yahya Cholil Staquf (Fifth Secretary to the Nahdlatul Ulama Supreme Council, responsible for Politics and International Affairs) and C. Holland Taylor. A third Muslim theologian in the NU/LibForAll delegation—Kyai Haji Adib Hattani—is a prominent leader in Ansor, the NU’s 10-million-member youth wing. 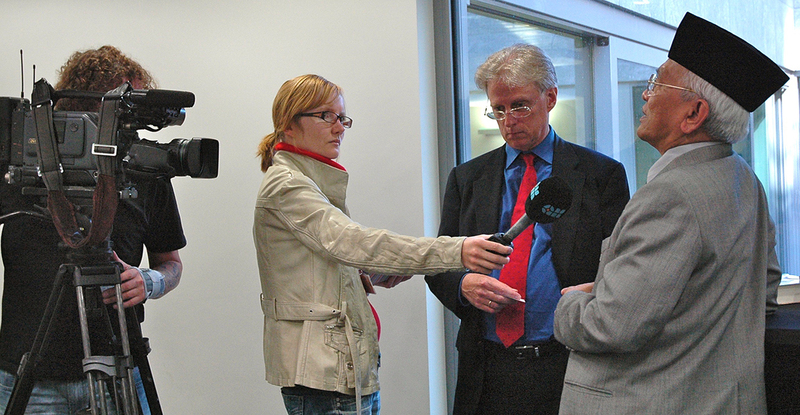 “Gus Mus’s visit to America attracted the attention of various figures. No less than President Obama’s team of national security advisors specializing in Islam invited Gus Mus to the White House to hear his views. The same thing occurred at the Center for Security Policy, an American think tank headed by Frank J. Gaffney, Jr., a former Assistant Secretary of Defense…. where a group of people whose only prior point of reference about Islam stemmed from Wahhabis and other extremists… [were] completely expressionless as Gus Mus complained, ‘One of America’s closest allies is Saudi Arabia. And yet the Saudis’ ideological confederates, in Indonesia, curse the United States every day. And because we [of the Nahdlatul Ulama] are firmly committed to the path of moderation and tolerance, these same Wahhabi sympathizers denounce us as American agents. Even though America has no idea who we are!! !’” Read the full article (PDF). “In many ways, Indonesia resembles Britain in World War II. Hitler’s failure to seize the UK cost him that war, as Britain transformed itself into an ‘unsinkable aircraft carrier,’ and the base from which the liberation of Europe was launched. Similarly—given its rich spiritual traditions, and extensive population of ulama (Muslim religious scholars) who possess a profound knowledge of both the exoteric and esoteric dimensions of Islam—Indonesia can serve as a launching pad for an intellectual and cultural assault upon extremist ideology throughout the Muslim world. “Good morning, ladies and gentlemen. First of all, I would like to say that I am profoundly thankful to God for this opportunity to meet you. It is an honor and a pleasure for me to become acquainted with my fellow human beings, for although your religion or nationality may differ from mine, we are all children of Adam, spiritually ennobled by God. 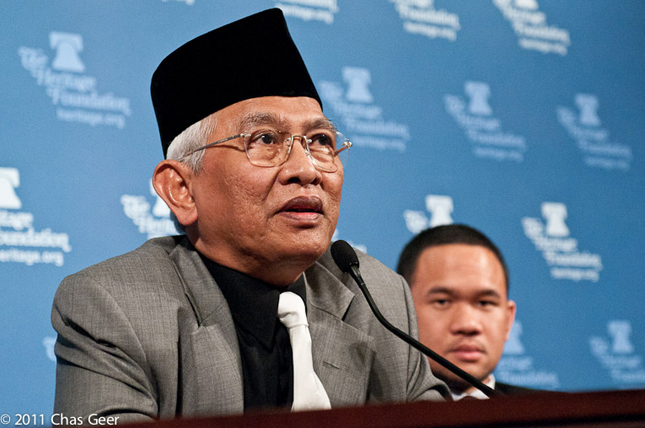 “We have come from very far—the nation of Indonesia—and we are from the Nahdlatul Ulama organization, which for many years was run by our [first democratically-elected] president, Kyai Haji Abdurrahman Wahid. We of the Nahdlatul Ulama and LibForAll—which Mr. Holland co-founded and heads—we of the NU and LibForAll are united by our concern about the world’s precarious condition. “In the Nahdlatul Ulama, we affirm and embrace certain immutable principles, which include following the ‘middle path’; honoring all human beings; acknowledging the existence of diversity that characterizes life in this world; and the inestimable value of peace. “For that reason, the spread of hatred and violence in the world deeply concerns us. We shall do everything in our power [to address this threat], and we are prepared to work in this cause with anyone who loves peace and humanity. God alone will determine the success or failure of our efforts, but we have no doubt that it is our human and religious duty to strive with all our might in the cause of peace. “It is written in Muslims’ holy scripture, which we call the Qur’an, that God said, “We created and spiritually ennobled mankind.” Thus, we are certain—from a religious and theological perspective—that anyone who disdains human life, or fails to treat their fellow human beings with dignity, is contravening the most basic principles of religion, as we understand them. “We feel great sorrow viewing the condition of the world today, in which extremist ideology is fostering both Islamophobia and Muslims’ phobia towards the West, to the point that all too many people have yielded to prejudice and lost not only the interest, but even the ability to know one another and to learn from each other. “Let me pay my respects and thank Mustofa Bisri, for not only the work that you have done here but for your lifelong work of peace. I want to thank you not only from my perspective, but on behalf of the American people…. “I was often asked in the White House, ‘What does victory in the war on terror look like?’ Is it simply capturing or killing bin Laden? Is it seeing particular cells disrupted? Is it stopping any attacks on the homeland? That’s all part of it, but the real victory in the long war on terrorism is ideological. It will come when there is critical mass, as Holland described. Critical mass within Muslim communities to actually counter this ideology of hatred and division…. “What I find most encouraging, and have always found encouraging about the work of Holland Taylor, the work that he did with Gus Dur, God bless his soul, was to think of this [problem] not just from a local perspective, but [rather], the need to create a global network to counter this ideological onslaught…. And what I have found so encouraging about the work that has been done, and is reflected in this book, is the fact that it is not a singular act of resistance against the ideology at play here, but part of a global network that is being formed…. “Finally, from a US perspective, we have not done very well at all, and I will point the finger at myself first and foremost, as well as others who have been in the counter-terrorism and national security community: we have not figured out how to support these very networks: the moderates and voices of pluralism…. How do we, as an American people and as a government, actually support these networks? “This book and the ideas within it offer hope that Muslims can build institutions based on the ideas of liberty…. It also provides legitimacy and validity from a scholarly perspective, from an Islamic perspective, [confirming] that the ideas many of us harbor, that many of our families came to the U.S. to celebrate, are actually grounded in Islamic theological and clerical scholarship, and not—as I am often told—just part of my own ‘personal’ Islam. “But why is this important to all of you, and to American foreign policy and strategy? Because we can either view [the conflict with Muslim extremists] as ‘the West against Islam,’ or as a battle ‘within the House of Islam.’ I think the former will keep us at odds with a quarter of the world’s population from here to eternity, while the latter [perspective] will allow us to help Muslim communities evolve in [much] the same way the West did, which is from an idea—that the separation of church and state, or mosque and state in our case, is key to defeating a theocratic form of fascism…. “At LibForAll Foundation, we often say that ideology is more dangerous than bombs. If you look at the dynamics in the world today, people who belong to terrorist organizations are being hunted down like dogs, not simply by Western governments but by Muslim governments as well, almost everywhere. And yet the ideology of Islamist extremism seeks to seize power in Muslim-majority countries, and then utilize the repressive apparatus of the state to enforce its narrow, rigid and supremacist understanding of Islam not only upon the population of the countries in question, but to export that ideology worldwide…. “Now, as Juan said, Western governments, including the United States, are faced with a dilemma in terms of how to deal with this threat. Islamist extremism is a form of totalitarianism that’s managed to leap the species barrier. In Nazism, you had a racist supremacist ideology, a Germanic supremacist ideology, which the U.S. did not hesitate to identify, isolate and defeat. With international Marxism-Leninism, the West faced an atheistic, totalitarian ideology that it similarly strove to identify, isolate and defeat. But in this case, what we’re facing is an ideology that has embedded itself in a religion. Like the bird flu, leaping the species barrier. “Out of respect for religion, a lack of understanding of Islam, and a disinclination to get involved in sensitive theological issues, Western governments find it extremely difficult to leap that species barrier and challenge the totalitarians, who are feverishly embedding themselves in the religion of Islam. And yet the reality is, whenever a Muslim terrorist explodes a bomb in a crowded marketplace, whatever other factors may lie behind the act—for example, there’s always an individual story, as well as a family dynamic, a social dynamic, and perhaps even an economic dynamic—but one thing is certain: there is always a unifying theological dynamic at play. “It’s just like in any bomb, you might have yellow, red and blue wires, but in the case of Islamist terrorism, there’s always a green wire. And if people refuse to clip the green wire, claiming ‘we can’t touch religion, we can’t get involved with theology,’ then the bomb’s going to explode. It’s as simple as that. “Western governments’ and Western societies’ refusal to get involved in theological issues related to Islam constitutes a willful refusal to tackle the heart of the problem. Because you can kill as many terrorists as you want, but as long as the ideology continues to spread, the population of terrorists will regenerate. 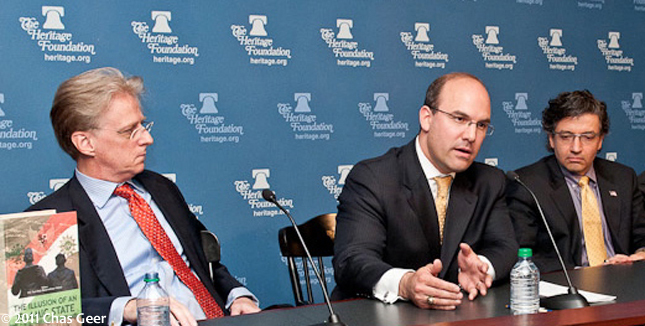 “Obama officials, and hard-line conservatives who assert that all Muslims are radical, should have come over to the Heritage Foundation this morning. The ostensible purpose of a two-hour session was the English translation of a landmark Indonesian book, The Illusion of an Islamic State…. “That original book provided Indonesians with a theological argument against advocates of a radical interpretation of Islam. It also supplied a wealth of revealing information on the degree to which outside forces (Saudi Arabian Wahabbists), funded generously by oil money, had sought to manipulate the 2009 national election in the largest Islamic democracy in the world. The result was remarkable: a repudiation of the vice presidential candidate backed by the Muslim Brotherhood-related PKS party and a new determination to reject the exclusionary, radical and violent sort of Islam that, in the minds of many in the West, has come to represent the only “legitimate” type of Islam…. “The event and the panelists’ message is sure to annoy the sort of Muslim activists who objected to the radicalization hearings and deny that Islamic terrorism, at its root, is a manifestation of radical ideology. It also will sound jarring to those on the right who insist (ironically, as the radical Muslims do) that the Koran is to be taken literally and that the radicals are the “real” face of Islam. But, then, the book is meant to stir debate, undermine misconceptions and shatter the aura of legitimacy that radical Muslim leaders have erected. In that regard, the book and the Heritage event should be considered a roaring success.” Read the full article (PDF). The ebook version can be read on Kindle and Kindle apps for iPad, iPhone, iPod touch, Mac, PC, Blackberry, and Android-based devices.